Returning to golf following shoulder rehab can be a long and frustrating process. Since you are generating a significant amount of force with your shoulder muscles, making sure that they are working efficiently is extremely important. Why does shoulder rehab take so long? A very simple question, however, the answer is more complicated! Your shoulder is the most mobile joint in the human body, capable of wide arcs of motion in almost every possible angle. Your shoulder spins, glides, rotates, elevates, etc. Whenever you have a joint capable of such large arcs of motion, combined with the specific kinematics at the joint, you need a lot of restraint. Your rotator cuff and the surrounding soft tissues provide much of this restraint. There is very little bony stability at the shoulder, which makes it very different than the hip. This reliance on your soft tissue is why a rotator cuff injury is so common. Out of the severe shoulder injuries, rotator cuff tears are one of the most common. The rotator cuff is comprised of four muscles, with the most commonly injured being the supraspinatus. There are different levels of severity in regards to rotator cuff tears. Massive tears obviously require a little more care and restraint than small tears. Most rotator cuff repairs are performed arthroscopically now, but very large tears might require an actual incision. A typical protocol for a rotator cuff repair is 6 weeks without any active shoulder motion, and then an additional 2 weeks before any rotator cuff strengthening. There may be some slight variations depending on severity, and surgeon, of course. Initially, your rehab will focus heavily on regaining range of motion. Once allowed, general strengthening will begin with an eventual transition to more specific rotator cuff exercises. 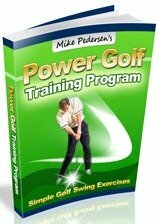 Only after you have adequate motion and strength, can any sort of golf specific training or drill be performed. Do not expect to be 100% by 2 month post-op! Chances are, you will be nowhere even close to golfing shape by 2 months. Your muscles will still be exceptionally weak, and you likely will be lacking full range of motion. Physical therapy will help get back into playing form, but it will take some time! -Normal, pain free range of motion. No cheating, no compensations. -Shoulder strength at least 80% of non-surgical side. A realistic time frame for a return to a full golf swing following shoulder rehab is approx. 4 months. This could be influenced by a variety of factors, so it is not set in stone. Also, this is assuming the everything goes perfectly according to plans as well. And as always with any sport injury, please consult your MD before returning to any sport specific activity! This cannot be stressed enough! And when that time comes, consultation with a physical therapist and/or golf pro familiar with returning to golf after this type of surgery would be very beneficial. While technically not as involved as a rotator cuff tear, a subacromial decompression is a surgery nonetheless, and it will keep you off of the course for an extended period. This surgery involves bone spurs that develop over time on the underside of what is referred to as your AC joint. Your AC joint is where your collar bone and shoulder blade attach to each other directly above your shoulder joint. The bone spurs that develop eventually will rub, or pinch, the tissues that lie directly underneath. These tissues are a bursa sac as well as the supraspinatus muscle, which is one of the four rotator cuff muscles. The friction caused by these spurs can lead to bursitis, tendonitis, impingement, and/or a rotator cuff tear. A subacromial decompression is a surgical intervention where the bone spurs are removed, opening up the space underneath the AC joint. Healing time is highly variable, but a general time frame is 4-6 weeks. Likely return to golf would occur at the end of that time frame, with approval needing to be granted by the surgeon first.